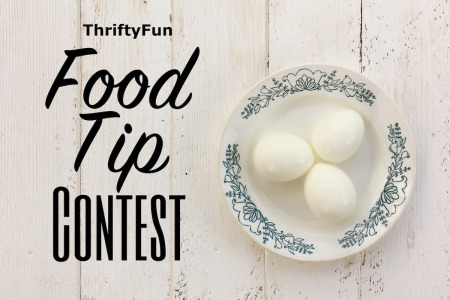 Share Your Food Tip Contest Try our new form! Your tip must be written by you and photos must be taken by you. Photos must be clear and of high resolution to be considered for publication. Tips with a photo increase your chances of winning the contest. Rewards are sent by email using Paypal or Amazon Gift Cards (US only). You can also choose to donate your Rewards to charity. Tips may be edited for clarity, at the discretion of our editors. Proper spelling, punctuation, and grammar save our editors time and make your post more likely to be selected for publication. At the completion of the contest, we award a $50 prize to the best tip, chosen by our editors. While the winning tip is ultimately an editorial decision, the popularity of the tip, the number of thumbs ups on ThriftyFun, likes on Facebook, pins on Pinterest and success on other social network sites factor into our decision. We are looking for original and unique unpublished content. Exceptions may be made for personal blogs, at the editor's discretion. All text, including step by step instructions must be written by you and include your own photos. Submitting copyrighted material is prohibited. This includes images found on Pinterest, Facebook or other social networking sites. If any contest doesn't receive the minimum number of submissions (10), the contest will be extended for an additional month. Generated 2019/04/25 17:43:30 in 83 msecs.